Baking gluten-free cookies takes trial and error. As you bake you will learn tricks to help you perfect your approach. Use these do’s and don’ts to get started. The most common products containing gluten are barley, rye, triticale (a cross between wheat and rye), and of course, wheat. The term “flour” is often implicitly understood as “wheat flour.” Don’t forget the many types of wheat flour on supermarket shelves — all-purpose flour, bromated flour, cake flour, enriched flour, phosphated flour, plain flour, self-rising flour, and whole wheat flour, to name a few. Other wheat products to avoid in gluten-free baking are bulgur, durum flour, farina, graham flour, kamut, semolina, and spelt. Certain items may be processed, mixed, or contain gluten, whether as an ingredient, additive or preservative. Other gluten-containing grains, like barley and rye, are not required to be labeled. “Wheat-free” is not the same as “gluten-free.” Further, some products like oats and oatmeal can be problematic as they might be cross contaminated with wheat crops. Look for these products which are usually gluten-free: almond flour, amaranth, brown rice flour, buckwheat, chick pea flour, corn flour, flax, hazelnut flour, millet, peanut flour, potato flour, quinoa, sorghum flour, soybean flour, teff, and white rice flour. Thickeners include arrowroot, cornstarch, potato starch, and tapioca starch. Always make sure your work surfaces, utensils, pans and tools are free of gluten. Devote a set of bowls, tools, and a cabinet shelf exclusively to gluten-free baking. Sift flours and starches twice – prior to and after measuring – to improve cookie texture. Set gluten-free dough in the refrigerator at least ½ hour (or up to overnight) to soften and improve dough texture. Further, gluten-free baked goods can lose moisture and quality quickly. After baking and cooling, wrap them tightly and store in the refrigerator or freezer in an airtight container to prevent them from becoming dry and stale. Don’t assume a product is gluten-free. 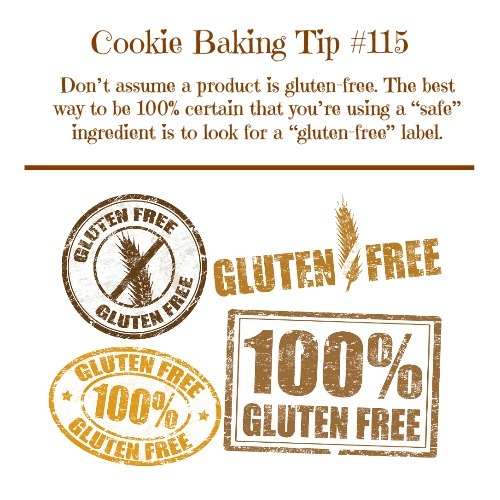 The best way to be 100% certain that you’re using a “safe” ingredient is to look for a “gluten-free” label, an increasingly common designation. Don’t over beat gluten-free cookie dough. Kneading time is shorter since there is no gluten to develop. If you overbeat, dough may get tough because gluten bonds get too elastic. Baking gluten-free cookies takes a bit of practice. The Elf had to learn how. So do you. Give yourself a bit of grace and learn from every batch of cookies you bake. Soon you will be a gluten-free maven when it comes to cookies.